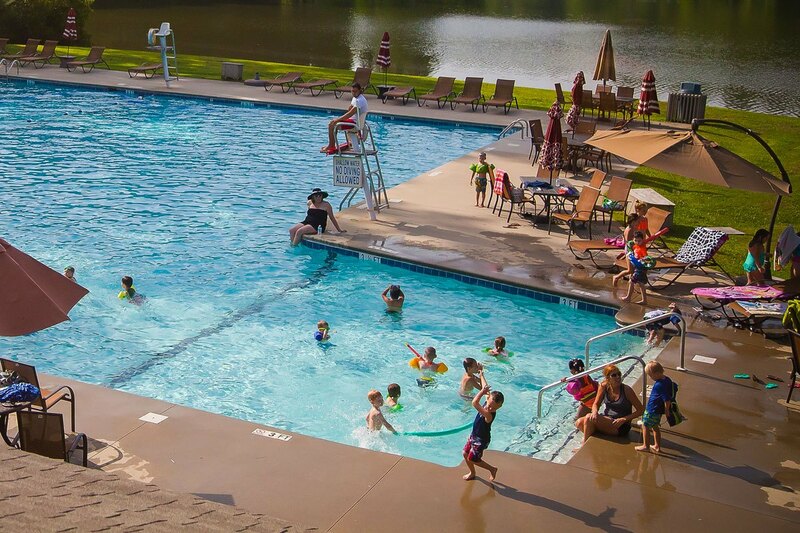 Not only does the nearly 2,500 square foot, Z-shaped Gatewood Pool provide ample space for swimmers of all ages, it is beautifully nestled among the beautiful tree filled landscape and lake behind the clubhouse at the end of Club Drive. Enjoy the sun, take a dip or simply retreat under oversized umbrellas. With an extended swimming season of five months (May through September), the Gatewood Pool is perfect for a day of relaxation, a pool party or even an evening event. With 24-hour notice, our pool will provide handicap access. From time to time, it is necessary to close the pool early due to a booked function that may involve the pool area such as private parties or wedding rehearsals or receptions. Early closures will be posted ahead of time at the pool shack and on the Events Calendar. Wanting to host a summer pool party? Please be sure to read our Pool Party Policy. Call the Club office with any questions or to book your party at Gatewood Pool. Complete this Pool Membership Application and return it to our office to get the process started.